It took me a while to determine what this tree is, even though it resides in our backyard (the former owners didn’t provide a tree legend, if you can imagine that.) It’s an American sycamore, Platanus occidentalis. Though the background doesn’t really give that impression, this was taken on a rainy day in the fall, when the rain had brought out the curious coloration of the bark sharply – I won’t swear that’s one of its own leaves hanging off the flaking bark, but it looks about right. 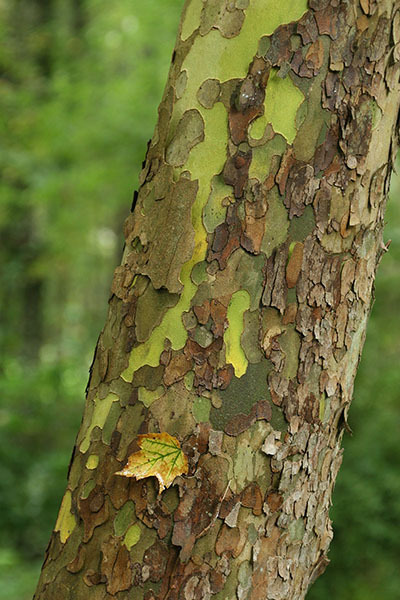 I’ve suggested to The Girlfriend that she use the copious bark flakes from this tree in some artistic project – they’re almost like thin cardboard in nature, with a wide variety of colors, and are easily gathered from the ground beneath the tree. The interesting thing about the color of this image is, it’s only the small bright patches on the trunk and the leaf, contrasting against the immediate surroundings, that make it seem ‘vivid’ – take them out and the impression of color drops off.